T-mobile is expected to release the new Danger Sidekick device. 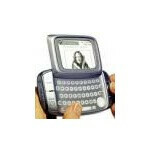 The device features full QWERTY keyboard, mobile phone, and accessory port for camera (Danger Sidekick specs). The device is expected to be released in the upcoming weeks and to cost $200 including 50$ rebate. According to RBC's report, T-Mobile is expected to start offering a new service plan, which will give users unlimited data access for $39.99 per month, 200 anytime voice minutes and 1000 weekend minutes and 1000 text messages. T-Mobile spokesman Brian Zidar confirmed that the plan is accurate and will roll out with the Sidekick device in early October.